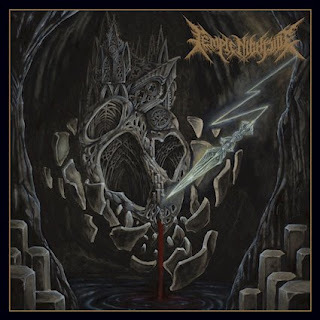 Temple Nightside are a band from Australia that has had music reviewed before in this zine and plays a ritualistic and occult mixture of black and death metal and this is a review of their 2018 album "Recondemnation" which will be released in November by Iron Bonehead Productions and is also a re-recording of their 2013 album "Condemnation". A very dark and heavy sound starts off the album before going into a very fast and brutal war metal direction which also uses a great amount of blast beats while the vocals are mostly bestial death metal growls along with the solos and leads also being done in a very raw and chaotic style. Most of the tracks a re very long and epic in length while elements of doom metal can also be heard in the slower sections of the songs along with the leads also having their melodic and atmospheric moments as well as some black metal screams also being utilized at times and as the album progresses the music starts getting more ritualistic and all of the musical instruments have a very powerful sound to them and as the album progresses a brief use of clean playing can also be heard and they close the album with a cover of Mayhem's "Life Eternal"..
On this recording Temple Nightside takes all of the songs from their 2013 album and re-records them and the songs have a better quality than the original version while still being in a black/death metal style, the production sounds very professional while the lyrics cover occultism, mysticism, and Death themes. In my opinion this is another great sounding recording from Temple Nightside and if you are a fan of occult and ritualistic black/death metal, you should check out this album. RECOMMENDED TRACKS INCLUDE "Shrine Of the Summon" "Dagger Of Necromantic Decay (Eater of Hearts)" and "Life Eternal". 8 out of 10.